The Downtown on Ice skating rink is now open everyday (including holidays) until January 16, 2012 at Pershing Square: 532 S. Olive St. in Downtown Los Angeles. 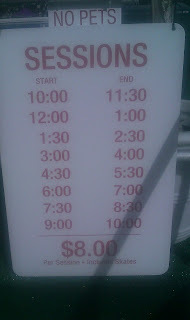 The price is $8 per person including skate rental, cash only. Skate rental sizes are available from a toddler's 6 to a man's 15. Attendants recommend that any adult skating with a toddler be a skillful skater. Underground parking is available on-site with discounted rates when you show your skating receipt. Or, take Montebello Bus Lines Route 40 along Beverly Blvd and get off at Pershing Square. Click here for a $1 off skating coupon from Montebello Bus Lines. "It's Christmas, Snoopy" sneak preview performance on Tuesday, November 29 at 4pm. This is a sneak preview of the skating spectacular show at Knott's Berry Farm. Winter Holiday Festival: Saturday, December 10, 11am-7pm. Santa and his reindeer will make an appearance, along with snow, train rides, crafts and other free activities. 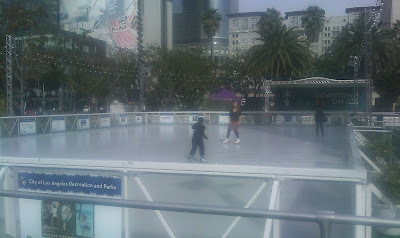 For more information about Downtown on Ice visit http://laparks.org/pershingsquare/.